Moses Kinobe. 45 nga mutuuze mu zooni ya Nansana East II zooni ye yakwatiddwa oluvannyuma lwa mukyala we Ruth Natukunda okwekubira enduulu ku poliisi nga bba bw’atunze ewaka nadduka nga talina na buyambi bwamuwadde. Kinobe yagguddwako omusango gw’okutulugunya omukazi era naggalirwa mu kadukulu ka poliisi ye Nansana ng’okunonyereza bwe kugenda mu maaso. BUGANDA STATE, MASAKA- Residents of Kitengeesa Trading Centre in Buwunga Sub-county, Masaka District were on Wednesday shocked when they found a two-year-old girl locked in a house with a body of her mother. The residents say, the woman whose identities are not yet established might have died inside the house about two or three days ago. The area Local Council 1 chairperson, Mr Qudra Mwanje said that the residents were attracted by a foul stench and flies that came out of the house. “The door remained locked for some days but when we opened it, we found the baby girl seated on the bed. The body of her mother was laying on the same bed,” Mr Mwanje said. “The body was producing an unpleasant smell and fluids,” Mr Mwanje said. He said they found some edibles in the house. Police officers from Masaka Police Station took the body to Masaka Regional Referral Hospital for a post-mortem. The baby was handed over to the Police Child and Family Protection Unit as a search for relatives of the dead woman and the baby ensues. Soroti Regional Referral Hospital has closed its mortuary services following a breakdown of its refrigeration system. According to the hospital administration, the four-capacity refrigerator became faulty about two months ago and Shs4.6m is needed to have it fixed. Currently, residents who seek autopsy and preservation of bodies have to move 100km to either Lira or Mbale hospitals. Some are now opting for quick burials for their deceased relatives as they cannot meet the costs of transportation and treatment involved. “It wasn’t our wish to have the late buried in such a quick way but we had no cheap option as the mortuary was down,” Pastor Rogers Ekaju said, while referring to the renowned deputy Bishop for Soroti Baptist church, Moses Elebu, who died a fortnight ago. On Tuesday, relatives who had their deceased temporarily pushed in the morgue were waiting to rush the remains of their bodies home for burial. In an interview with Daily Monitor, the hospital director, Dr Francis Mulwanyi, confirmed the situation and appealed for government’s quick intervention. Dr Mulwanyi said the hospital is planning for a big refrigerator due to the high demand. The senior hospital administrator, Mr Paul Ajuku, said there has been delays in procurement. “You cannot use government resources the way you buy food for your family. Government has its own procedures as regards procurement and accountability. And these must be followed,” Mr Ajuk said. He revealed that the current morgue has two tables and can only accommodate four bodies. According to Mr Ajuk, for autopsy services, the hospital charges Shs150,000 per body, which is credited to the hospital account. He said the hospital which serves eight districts that constitute Teso sub-region, receives close to 1,000 patients weekly with several death registered. Although the crisis has not affected them yet, the East Kyoga police spokesperson, Mr Michael Odongo said the services offered at the morgue are so crucial in the day to day activities of police. In March 2016 , the Pathology Department at Mbarara University of Science and Technology teaching hospital has closed the mortuary following the breakdown of the refrigeration system and asked the police to stop taking dead bodies there. At 2pm yesterday, Aisha Namaganda rushed her sister’s son to Good Samaritan hospital in Mbuya, Kampala. The boy, about four years old, had suffered massive burns from the head, across the torso down to his thighs. The red flesh glistened where skin had been burnt off by hot water. Unable to deal with the extreme injuries, staff at Good Samaritan pointed Namaganda to the National Referral Hospital Mulago. Under normal circumstances, Mulago’s burns unit would have treated the boy’s case as an emergency. But these are unusual times: Mulago is being renovated and Kiruddu hospital to which they were referred is one of the three facilities built to accommodate these kinds of cases but is also essentially shut-down by the crippling doctors’ strike. Wailing from the pain, the little boy and his aunt were shown to the waiting area by receptionists; no sense of urgency in their response to what was a clear emergency. In shock at what had befallen her little one, the boy’s mother had remained at home. By press time, 8pm, this emergency case had not been attended to – another example of the grief which government’s refusal to increase doctors pay is causing. 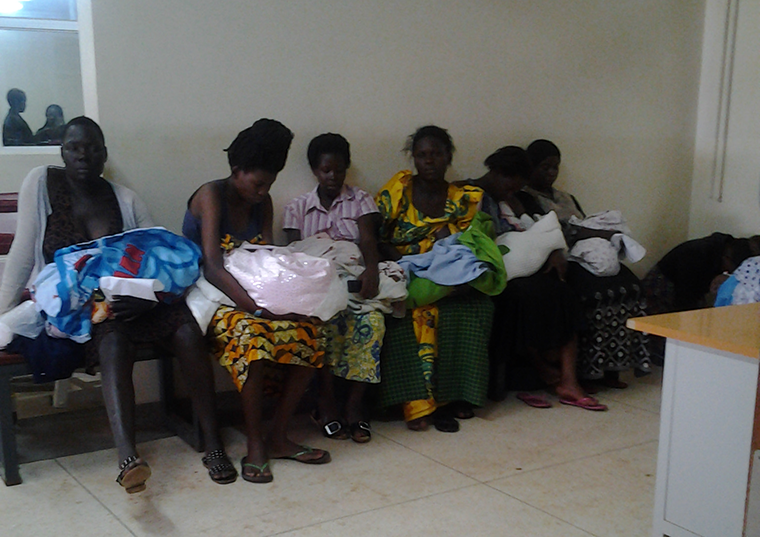 Across town, a teary Mariam, a resident of Matugga, narrated the excruciating pain she went through to deliver her child last Saturday at Kawempe General hospital, also a subsidiary of the National Referral Hospital Mulago. If she had known better, Mariam would have paid up front as it later became clear that those who could shell out the cash were being treated as ‘emergencies’. The young mother says she reached Kawempe General last Tuesday (November 7) at 1pm. There were very few doctors around since most of them had laid down their tools as the pay dispute with government rambled on. “The labour pains had started but the nurses advised me to be patient and wait for the few intern doctors who were moving around the ward and they advise them on what to do since I had remained with a few centimeters to give birth,” she said. As the labour pains intensified, the nurses seemed unbothered even when Mariam called for them. She suffered through blinding pain throughout that day. Not a single doctor checked on her since the available few doctors were busy with other patients whom the nurses described to her as emergency cases. “The next day my mother struggled so much and brought a doctor to check on me if I was ready to go in the labour ward due to the much pain I was feeling. The doctor advised me to go for a cesarean operation since the baby was tired and could no longer manage to push itself through normal delivery and I might lose it,” Mariam said. She said, doctors lined her up on the list of patients to be operated that day and ordered the nurses to prepare her. “I kept on waiting for nurses to take me to the theatre but it was in vain. After some hours, they told me that I was removed from the list because the doctors were working on the emergencies and I was rescheduled for the next day,” Mariam said. Mariam said she just managed to save her baby’s life after getting advice from a patient on the hospital bed next to hers who told her to give money to the nurses. “The following day in the morning, I called the nurse and gave her Shs 50,000. She immediately understood what that meant without even telling her anything. She took me to the theatre very fast saying that I was also an emergency,” she said. Mariam was shedding copious tears as she spoke to The Observer, recalling how the skeleton staff of doctors on call during this strike will not ask a patient for money directly either because they fear or because of untidiness of it all. They instead work through a subtle arrangement with nurses: the money is funneled by nurses on their behalf. She said before paying for her operation as she waited outside the theatre, a group of nurses abused them, saying that it’s women who always vote for President Museveni, so let them suffer. The implication being that Uganda’s mothers should pay for the failure by Museveni’s government to sort out public health service delivery. They said, “When they say temugikwatako, you keep quiet but when they say bagikwateko you say yyeeeeeeee…., okay. We shall cut you.” I got scared. I thought that I was not even going to make it, but thank God I was operated successfully and my baby is okay,” she said. Mariam was operated upon on Saturday and has been on treatment. The doctors prescribe drugs which she buys from outside the hospital. Another patient, Margaret, whom The Observer found in the elevator moving to the 5th floor to breastfeed her baby in the Neonatal Intensive Care Unit (NICU) was also weeping. Margaret was tired and hungry; she had not eaten a thing since morning because all the money she had, she had given to the nurses and doctors to help her deliver. She said when the strike had just started, doctors were accepting between Shs 20,000 and Shs 50,000, but as the strike progressed, the going rate doubled to between Shs 50,000 and Shs 100,000 for normal deliveries, and between Shs 300,000 and Shs 400,000 for an operation. “But if the strike continues, the charges will go up to Shs 1 million. The government should help us and find an immediate solution for the doctors’ salaries and welfare,” Margaret said. She said many mothers who come to deliver in the night are ignored if they don’t have money; so, the majority are forced to leave. Only God knows what becomes of them. Speaking off the record, sources at Kawempe General also said that an unknown number of mothers and babies have died during this strike since there are very few intern doctors working and they can’t manage complicated issues. “Every time you see people crying when they have lost their dear one because they have no money to bribe doctors and the few doctors available can’t manage all the patients,” a source said. The doctors at Kawempe who didn’t want to be quoted said, they are being very understanding with their fellow Ugandans and that is why they still come and work. “In Kenya, all the doctors, nurses and midwives went on strike and they never returned to work until their problems were solved. But in Uganda at least a few of us have managed to work to save the lives of Ugandan mothers who are giving birth any time yet our problems are not yet addressed,” a doctor said. One doctor said if the strike continues, they are also going to give up because they are very few and can’t manage the overwhelming number of patients flooding the hospital. At the Naguru-based China-Uganda Friendship hospital, Jesca Bereebera who had come to pick her drugs for high blood pressure and diabetes, arrived at 8am. She left at noon without seeing any doctor. “I came here for doctors to prescribe drugs for my pressure and buy drugs outside because I wasn’t feeling well. But since morning, none of the doctors has attended to us apart from seeing them moving around pretending to work yet they are doing their own things,” she said. 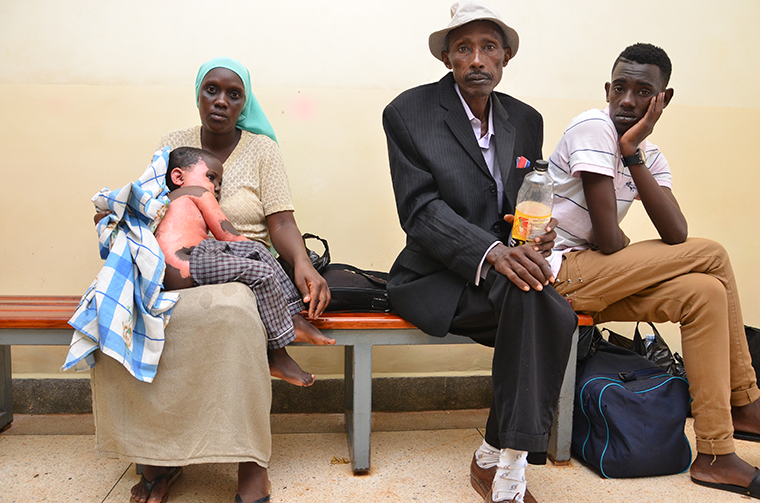 Melesa Nalumamsi, a resident of Muyenga, also left Naguru hospital without seeing a doctor. One of her breasts hurts so bad she needs urgent attention. Sarah Nakandi at Naguru hospital said if you have money and pay doctors, they work on you. “I have also given them money and they are now looking for some drugs to give me,” she said. 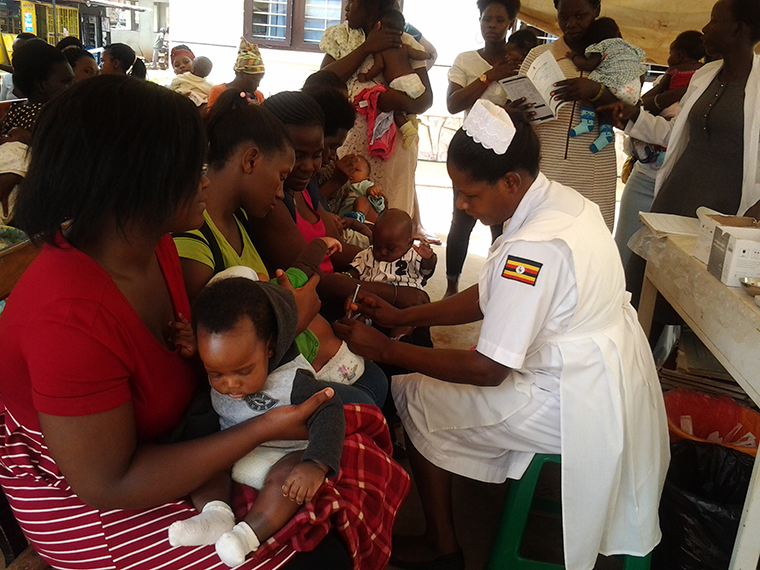 However at Naguru hospital, the children’s clinic for immunisation was still open and all babies were receiving their vaccines, although the nurses too threatened to join the strike if the government doesn’t address their problems too. “We have been immunizing children every day since the strike started and our senior principal nursing officer told us to work saying that the strike is for doctors, not for nurses. But our worry is that we are working as nurses while doctors strike but if the government considers doctors only and leaves out nurses, we shall also strike,” a nursing officer at Naguru said. She said they immunise over 60 babies at Naguru hospital every day and they can’t leave babies to suffer. The doctors’ strike has entered its 10th day with no end in sight. Their long-standing demands for better remuneration remain unmet. Instead, Health minister Jane Ruth Aceng last Thursday threatened to sack doctors on strike before addressing their problems. Her threats aggravated the situation, deeply upsetting the few intern doctors who were assisting patients, prompting them to also lay down their tools in solidarity with their senior colleagues. When third term began, some children who ought to be in school did not make it back. Some may have dropped out school as recently as last term probably for financial reasons while others dropped out a long time ago. While government and non-governmental organisations have highlighted the importance of educating girls, for several reasons, many girls of school-going age are left out. According to Kenneth Kapuru, the child protection officer at Action for Community Development (ACOEV), sometimes it is about culture. Some people still think that a girl’s contribution to the household is more valued than her personal education. “In many parts of Uganda, poverty is a big concern. Sometimes there is not enough to eat. Considering the school fees and other requirements, some parents opt to keep their daughters at home and send the boys to school instead,” says Kapuru. If there is not enough food or clean water, girls may not be well enough to attend school. For these and other reasons, girls remain out of school. Since June 30 this year, Jane Nakafeero, (13) has been out of school. The Primary Three pupil from Namato Primary School in Nakasongola District is not in school due to a sight problem. At the beginning of the year, Nakafeero complained about reduced sight but her parents could not afford to take her for a checkup and the accompanying treatment. With the help of ACODEV, Nakafeero was brought to Mengo Hospital in Kampala where several tests and a surgery were done but this did not improve her situation. “I can only see things that are very near and while in class, I cannot see clearly on the blackboard,” Nakafeero says shyly. Having gone through an unsuccessful eye surgery, when she was taken for review, the doctor recommended that she attends a school for children with visual impairment. The 2014 national demographic health survey (UDHS) shows there are about 500,000 people with low vision and blindness in Uganda. Grace Nuwatekateka (16) lives with her grandmother in Kyabigulu village in Nakaseke District. Irene Sanyu, the district probation and social welfare officer for Nakaseke received a phone call about the ongoing marriage of the 16-year-old girl. Nuwatekateka was to be married off to one of the sub-county councillors of Kinoni sub-county. Sanyu contacted Kiwoko police and travelled to the scene to stop the function. The case was reported in July 2017 but the girl has been out of school since the start of the year. The councilor, who is already married, promised to give Nuwatekateka’s guardians cows in exchange for their daughter and she had been withdrawn from school ahead of the marriage. The major barriers to girl’s education in Uganda are adolescent pregnancy and early marriage. According to Unicef about 35 per cent of girls drop out of school because of early marriage and 23 per cent because of early pregnancy (Unicef, 2015). For eight years, she has moved from one family to another working as a maid. Peninah Nandudu (17) is not in school because her father trafficked her. She was only two years old when her mother died, and this was the end of her dream of ever going to school. She has never entered a formal classroom. Nandudu is residing at Remnant Generation Ministries in Busega where she is nursing an eight months old son. “I stayed with my aunt when my mother died but when I was about eight years old, my father asked me to go and live with him and my stepmother. The rest of my siblings who he had with his new wife were going to school but when I showed interest, he said it was too late for me to go,” she recalls. Since she was not in school, Nandudu was then taken to the coastal town of Mombasa where she worked as a maid when she was about nine years old. Her father was promised Ksh3,000 every month. When she returned from Kenya, her father told her he had bought a small goat from her earnings and the rest of the money was used to take care of the family. Her father then told her to get an abortion and return to work. However, her new boss helped her seek refuge at Remnant Generation Ministries, a rehabilitation home for teenage mothers. Imelda Kyompiire was brought to the Remnant Generation Rehabilitation home in 2016 because she had conceived. The 17-year-old got pregnant at 16 years. “When my father learnt I was pregnant, he sent me away from home. The father of my child, however, was a student like me and I was afraid of living with his mother so I went to my older sister,” she recalls. When she was five months pregnant, she put up in a rented room where she lived alone. For five months, Kyompiire breastfed her child but had to take them to their father’s family when her mother said she was taking her back to school. Although she has not done so to date. Kyompiire believes whatever happened was a mistake but her father cannot forgive her. Monica Naiga wishes to become an early childhood development specialist. She reported for the first term of Senior Five but she has been out of school since February this year. “My father got another wife and thereafter, we never got his care again,” she explains. While the latest national household survey indicates that one in every five persons aged 15 and above has completed secondary education, if she is not given help, Naiga is set to become one of the many children left out. In primary education, gender parity is at 91 per cent of the school-age population being enrolled. However, female literacy rates lag behind at 49 per cent compared to 69 per cent of males and gender gaps widen at secondary and tertiary school (Organisation for Economic Co-operation and Development (OECD) 2015). Data from the Ministry of Education and Sports shows that school dropout in the country is higher at the primary level than at secondary level because of lack of interest, pregnancy, early marriages, hidden costs at school and family responsibilities. In Uganda, the rate of teenage pregnancy is at 24 per cent but increases up to 34 per cent in the poorest households. In rural areas 24 per cent of girls experience early pregnancy compared with 16 per cent of wealthier households and 21 per cent of urban girls (UNICEF, 2015). Many cultural scenarios in Uganda stigmatise pre-marital pregnancy among girls both in school and in communities because it is seen as a taboo. A girl who gets pregnant while still at school may be victimised on morality grounds. Early pregnancy has been found to cut short a girl’s education where girls withdraw themselves from school early or after giving birth (report by Ahikire and Madanda 2011). The practice of early marriage is still prevalent in Uganda and is highly associated with lower female access to secondary education. In 2013, Uganda was ranked 16th among 25 countries with the highest rates of early marriages, with 46 per cent of girls marrying before 18 years, and 12 per cent before they are 15 years (World Vision, 2013).